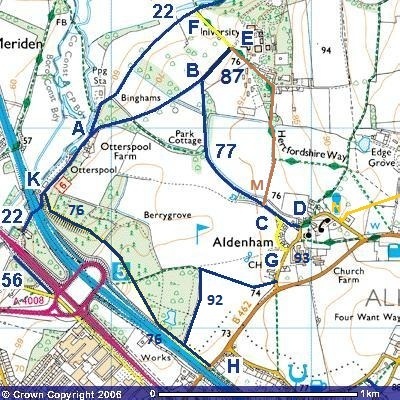 The Aldenham current major project is the addition of various paths in or near the Wall Hall part of the parish in order to create circular routes without riding along the B462 Watford Road. The paths were dedicated by the Hertfordshire County Council (courtesy of the Rural Estates Department and tenant farmer Mr Pinkerton), and Octagon (who developed the Wall Hall site). Aldenham 93 (C to G) - Dedicate for avoidance of doubt. Has been used since the 1970s. Aldenham 94 - New path to link Church Lane to High Cross, again missing the B462. Aldenham 12 (E to F) - Dedicate for avoidance of doubt. Has been used since the 1970s. Aldenham 87 (B to E) - Dedicate for avoidance of doubt. Has been used since the 1970s. Wall Hall Drive (E to M) - Add to definitive map as was used extensively in the past by riders. An application has been made to record this route based on the user evidence supplied. More evidence of use is aways helpful. 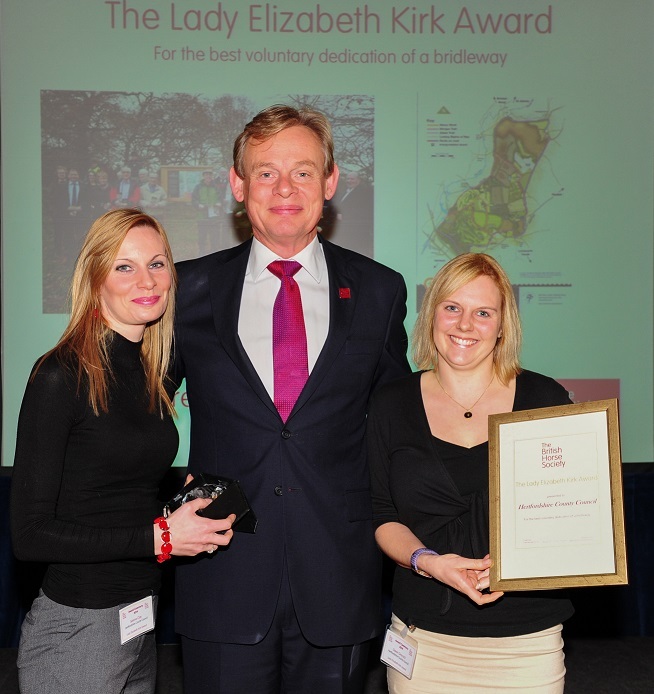 The County Council's Serena Clay (L) and Dawn Grocock receive the Lady Elizabeth Kirk Award from BHS President Martin Clunes (photograph courtesy of the BHS). This award is given annually for the best voluntary dedication of a bridleway. Watford Observer article on the Hertfordshire County Council's receiving a BHS award for their work on this project. If you value the work we do, why not register your support? With more supporters, we would have more influence with local authorities. © 2015 Patchetts Green Bridleways Trust.